The Council Division called Bamburgh includes a number of seaside villages including Bamburgh itself, Beadnell and Seahouses, as well as communities further inland, including Belford, Ellingham, Adderstone and Lucker. The area is world renown for its beautiful beaches and the iconic Bamburgh Castle. In 2008, Anne-Marie succeeded in helping local Harbour Master Captain Brabban win a grant of £750,000 to rebuild Seahouses harbour wall. Anne-Marie is now working towards winning a further grant for the installation of the rock armour needed to safeguard the future of the Harbour. 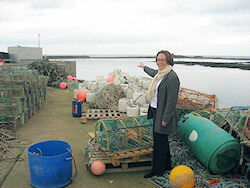 In 2010, Anne-Marie visited Seahouses with Richard Benyon MP, now the Government's Minister for Fisheries. Richard and Anne-Marie listened to local fishermen speak about the challenges posed by the former Labour Government's alphabet soup of regulatory agencies.